Making a lasting first impression is important. We also believe that establishing a patient-professional relationship early on is especially important as well. We made sure to reflect this philosophy through their customized web design. Luminous Smiles is on the quest to deliver a better smile to off their patients. 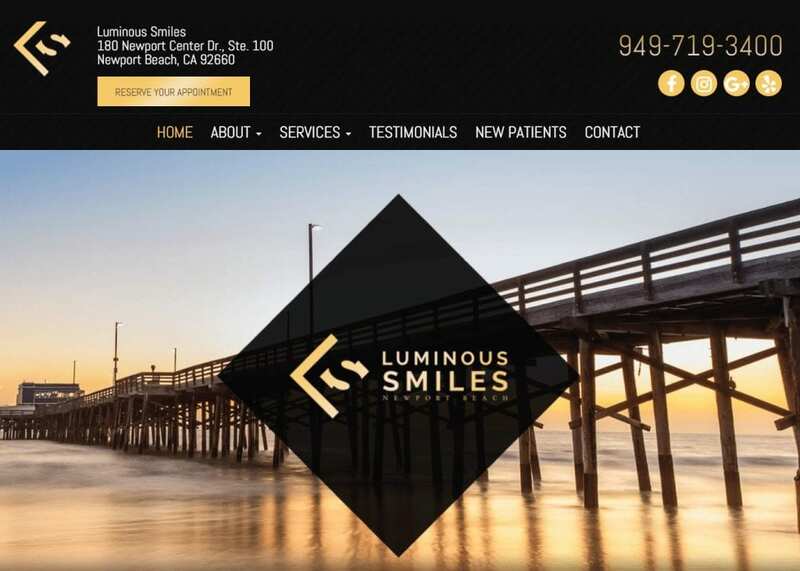 Focused on cosmetic and general dentistry, the office, located in Newport Beach requested us to design a website that would connect the community and surrounding area with a common goal for a brighter and whiter smile. When you enter the home page for the first time, you are immediately greeted with an image displaying the Newport Pier. Not only does this display a sense of connection to the community, but the beautiful background also allows visitors a chance to see themselves near the office. We opted to keep the readers brief and simple, allowing readers to dive deeper into the different services offered at Luminous Smiles. The homepage is essentially dedicated to a contact form, an interactive map, and direct quick links to other parts of the site on the bottom. The colors in this website create a beautiful palette when brought together, each one bringing its personality to the website. The black tones give the website a sense of professionalism and authority, providing the impression that this represents a business that engenders respect in its field. Black also gives the impression of sophistication and elegance. We also used gold to primarily highlight calls to action and add a feeling of elegance and class to the Newport natives. The naturalistic tones in the images themselves inviting viewers to investigate and find out what the office can do for them, furthermore. Everyone in the Bay area of California is emersed in fashion. Fashion goes hand in hand with mobile use. We made sure to make the website as responsive as possible by featuring simple, but concise design elements that would be optimal for both desktop and mobile users. We designed a hamburger menu that would replace the normal navigation menu for mobile patients as well as adding parallax effects on the headers to add a touch for flare. From the elegance of the company logo to the flow of the websites imagery, every element of it comes together to bring a sort of dreamy inspiration to the viewer. We also used animation to highlight and give the content a slight pop as you scroll and hover across the services offered. The testimonials tab on your navigation menu is the home to multiple reviews from real patients. We have also made it easier than ever to schedule an appointment by implementing a link to an appointment page on the right side of every webpage. Call to actions are subtly integrated on each web page for increased engagement. To top it all off, Luminous Smiles understands how important it is to keep patient information secure. As a result, they have incorporated SSL Security in their website. This means that patient information will be inaccessible to hackers around the world. With all the advanced technology the Newport natives have at their disposal, getting rid of any anxiety the patient may have before visiting the office can be a great way to start off on the right foot. Who knows, that anxious patient who felt more comfortable due to the visuals on the site may easily turn into a lifelong patient! Visitors will immediately think of quality and elegance when entering the webpage. Everything is formally laid out and professional. In short, Luminous Smiles is nothing less than bright and classy.